To ensure high quality standards that will enhance and support positive brand identification of the University of Illinois and units on the Urbana-Champaign campus. This policy applies to all banners intended for display on campus property by all University colleges, schools, institutes, departments, divisions, and other academic administrative units and committees. Banners (vexilla) on poles or facilities on the Urbana-Champaign campus must be approved by Facilities & Services (F&S) Planning Division. Units wishing to display banners should submit a completed request form, with proposed design, to the F&S Planning Division no later than one (1) month prior to the desired display date. Request forms are available on-line or may be picked up at 1501 South Oak Street, Champaign, Illinois. The F&S Planning Division shall review and approve, approve with modification, or deny applications within thirty (30) calendar days of submission. Projects will be considered on a first-come, first-served basis. Denied requests may be resubmitted to the F&S Planning Division for reevaluation if the proposal has been appropriately amended or defended. Upon approval by the F&S Planning Division, applicants shall contract for banners supply/fabrication. The Planning Division may limit the number of banners to be displayed by any one organization in order to ensure that all applicants have an opportunity to display their banners. The proposed quantity of banners at a given location will be determined with regard to context, relevance and duration at that location. Small banners may be permitted on designated pedestrian poles 16’-0” or less in height (installation by F&S required). Banners intended for use inside campus facilities shall be in compliance with fire spread regulations in the current edition of the International Building Code, chapter 8. All banners will be provided with 1/4” grommets located at the upper and lower corners on one side to be used to secure the banner in place. Medium- and large-size banners will be provided with appropriate wind pockets or ventilation to reduce the effect of wind stress on light standards. 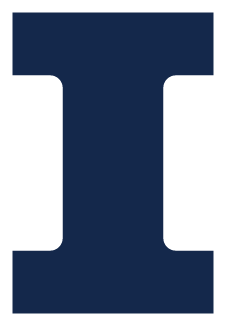 Either the “I” mark or the Illinois wordmark logo must be clearly displayed on each banner and must meet the standards set by the Office of Public Affairs. Banner graphics and/or text should be clear and easy to read from a distance (rule of thumb: limit of nine words for optimal reading) and should be printed with UV-resistant materials. Event banners are considered temporary and may replace long-term banners with the stipulation that said banners may be displayed up to one month preceding and for one (1) week following the event. Applicants shall arrange for the installation and removal of banners by F&S or a contractor approved by the F&S Planning Division. Installation, removal and specifications: Planning Division of Facilities & Services, (217) 244-8817. Design Compliance: Banners graphics must comply with Illinois Identity Standards and design guidelines established by the Office of Public Affairs. Graphic design service: Creative Services Office at Public Affairs, (217) 333-9200. Questions regarding this policy may be emailed to the Architecture Review Committee or by contacting the F&S Planning Division, (217) 244-8817.